One thing that isn’t improved: the bag design. Where’s the texting cowboy riding the giant fish, guys? Trader Joe’s can now proudly claim they belong to that class of supermarkets that doesn’t have canned pineapple, or beans, but does carry two different kinds of salmon jerky. Which is to say that Trader Joe’s is in a class all by itself. Worth it: No. Fish jerky tastes weird. Trader Joe’s Wild King Salmon Jerky is, yes, the second salmon jerky Trader Joe’s has brought to market. The original Wild Salmon Jerky I reviewed way back in 2012 when I first started this blog. Back then I had two big issues with their jerky. ( Or three, if you count the fact that it’s weird to jerk salmon in the first place). The original salmon jerky was very fishy smelling, almost like the smell you get from a box of fish food, and, worse, very sweet due to the addition of brown sugar, molasses, carmelized sugar, and maple syrup. As a result I gave the original salmon jerky a big thumbs down. 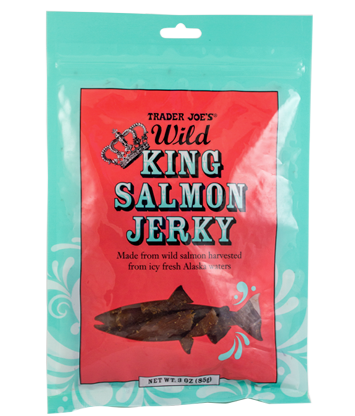 Trader Joe’s acknowledges on their own website that the original salmon jerky had some issues, and so decided to reformulate it – hence our new, slightly different named, wild king salmon jerky. However, is the new version any better? On both accounts, it actually is. This new salmon jerky has a far milder smell – nowhere near as fishy as the original version. TJ’s attributes this to the use of Alsakan king salmon instead of the previous chum salmon. I’d imagine there was probably a change in processing as well. I’m also happy to report that even Trader Joe’s is capable of stepping back from the howling abyss of madness, and decided to cut down way down on the amount of sickly sweet sugar going into this fish jerky. Like any good jerky brine, there’s still a dose of brown sugar in there, but it isn’t nearly as much. The result is a much cleaner taste, that lets the dried salmon taste speak for itself. Which brings up back to that third point from way up above. Yes, it’s a marked improvement on their last salmon jerky – but is it actually something you would want to eat? What does this fishy jerky taste like? Trader Joe’s indicates that this salmon was smoked as part of the jerking process, and that’s what you’ll taste most of all – the distinctive, musky flavor of smoked salmon. If you’ve ever had that, just imagine drying it out it’s hard, and spicing it with a dash of salt and garlic. It’s not necessarily the best taste in the world, but it is edible. I never found myself really enjoying it at any point in the way I might happily gnawing on a fine piece of beef jerky. That said, the flavors were more odd, than objectionable. I could imagine slowly becoming acustomed to it over time, but I can’t think of a reason why I would want to when Trader Joe’s offers a selection of other tasty jerkies – like their sriracha bacon jerky, and South African biltong jerky. While it’s certainly an improvement, there are better ways to eat your salmon, and better ways to eat your jerky. No need to take this detour aside from general human curiosity. Would I Recommend It: Not while there are so many other tasty types of jerky out there. Would I Buy It Again: No, I would not. Final Synopsis: An improved fish jerky – but still, it’s fish jerky. This is arguably the worst snack I bought in TJ. So sad. I am extraordinarily disappointed that this product was discontinued. I really enjoyed the flavor. I am on the low carb high fat diet and I like small pieces of this jerky for an occasional snack. I like this product and I suspect everyone’s taste is different. I wonder how well it is selling. I love the smoked salmon jerky. TJ used to have an ahi tuna jerky but unfortunately they discontinued it years ago. I highly recommend this jerky. The only other ahi tuna jerky I had for that was good was Costco in Hawaii. Next time I head over there I buying a couple pounds & taking it home. I really like it, and nope they don’t discontinue it.